I've almost finished preparing these shoe boxes to be sent to two girls somewhere in the world via the charity Samaritan's Purse. 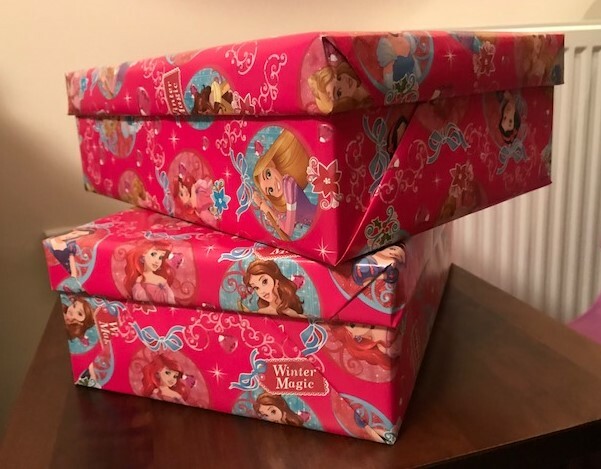 I enjoy picking out all of the gifts that go inside each box, I enjoy imagining the excited faces of the little girls who will receive these present-packed boxes and the lesson I hope to instill in my daughters of gratitude, giving and awareness of others in the world. But there is one thing that I don't love to do in regards to these shoe boxes - wrapping them! I honestly dread having to sit and wrap the lids separately from the actual box. Why? I'm not sure... but I simply don't... like... to... do... it... and yet, I still do it anyway. Sometimes we have to do things we simply don't like or want to do, right? I've been thinking all day about a comment that someone posted on a financial Facebook page that I follow. Just FYI, by "ef", she means an emergency fund. "Hi question about ef. How do you know which amount to aim for (£500-1000)? For instance, we own our home, within the last three years we have bought new most are appliances. My dh car is fair to say going to need to be replaced possibly in the next year. Mine is fine. But I don't think we'd need £1000 ef we have some money at aside for his new car already. I could see the reason behind having a higher ef if we had older, more unreliable items in our life but not as it stands." Hi, emergency funds are saved for unexpected occasions in your life, like job loss and isn’t necessarily just there to use to replace things that need replaced or repaired. Determining how much you have saved in an emergency fund depends on how many dependents there are in your family and how much risk you’re willing to take. You should also have sinking funds for things like Patricia mentioned: boiler service and repair, new-to-you car fund, MOT and annual service, House expenditures, holidays, birthdays, gifts for others, etc. These are expected expenses, things you know will eventually happen or are very likely to happen in the future. DR says we should have 3-6 months of expenses saved in an emergency fund. Hope this helps. I hope this helps you, too. I'm going to ask you something... how much do you have in your emergency fund? (Please tell me you have something saved for a "rainy day".) Initially a good place to start is to aim for £1,000, then after paying off all debts except your mortgage, boost your emergency fund to 3-6 months of expenses. I am not a financial expert, nor qualified in any way, but I do follow the advice of Dave Ramsey, an American financial adviser. The lady above didn't seem to understand the importance of having an emergency fund, otherwise she would have been motivated to do something that she doesn't seem to really want to do. You know what? I don't really want to find ways to save money every day. But I do. I don't really want to say "no" to buying things I really want... but I do. I don't really want to just have money "sitting" in an account just in case when I could be spending it on things to enjoy now... but I do. If you don't have money in an account set aside for life's emergencies, I want to urge you to start today... yep, even prior to Christmas. How can you start or boost your emergency fund today? Decide what your first goal for an emergency fund is: is it £500, £1000, or 3 months to 6 months of expenses? Create a spending plan (aka "budget") and allocate an amount from each month's wages to build to this goal. Are there items in your house you can sell? Even if it's only worth a few quid; it all adds up! Perhaps you have some money in an account already but it hasn't been dogeared for anything yet... you can either put it in another account or simply take a mental note that this amount isn't for spending unless it's an emergency. Perhaps you can work extra shifts and put that extra money towards your emergency fund. Maybe you have other ideas! I honestly want the best for you and your family. Having an emergency fund may seem strange or difficult. You know what?! It's worth the extra work and all the saying "no"s for peace of mind, right? Do it anyway.